I know that many parents worry about their child learning colour words. I do understand that many nurseries like a child to know their letters, numbers and colours. 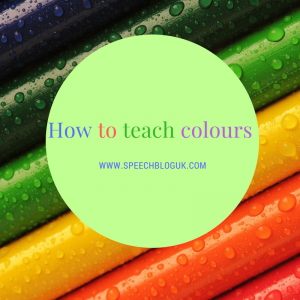 But as a speech and language therapist, checking if a child knows their colours is not the first thing on my list! I want to make sure that a child is following basic instructions, has a range of vocabulary and is linking words. It is at this point, where a child starts to use concepts such as big and little that colours normally start to develop so around the age of 2 1/2 – 3 years old. Firstly pick basic colours to start with. Most young children don’t know burgundy and aqua! Start with red, blue, green, yellow and maybe orange and pink! Teaching colours has an extra step compared to other concepts. With colour I always start with the question of “find me one the same”. So you need a number of objects in the colours you want to work on. It’s also best to start with 2 or 3 colours at first and then slowly add more in. The big tubs of wooden bricks work well as you get lots of each colour and they are normally good primary colours. Spread out lots of bricks, pick one up and ask the child to find you one the same. You can say the colour as well, but don’t expect the child to use it correctly yet. You can then sort the bricks into colour piles. Take your time at this stage – it is important. Only move on when your child is really secure with this task. You can do this with other things as well, but it might become confusing to the child. If you have a range of cars say in different colours, it might be odd to ask for one the same when the two blue cars look completely different! To keep it simple you could use coloured circles for example, so they are all the same except the colour. “Find me the ……. one”. So the next step is reliant on the child understanding the colour names and being able to find the appropriate one. You could use the bricks again, or coloured shapes, and ask the child to find a specific colour. Now if this is too hard, try holding up 2 or 3 items and asking for a specific colour. By reducing the options you are making it easier. When the child can do this confidently, move on to the last step. “What colour is this?” The final step needs the child to not only understand the idea of colour, but to make a judgement on the colour and then name it correctly. Again you can use your bricks or shapes and ask them to say what colour the item is. As an extension of this, you can let the child play teacher and ask you to find a certain colour. Every now and then get it wrong and hold up a different colour and see if they comment that you got it wrong (most children will immediately point out that you are wrong as its funny!!). You can then start generalising this skill on to other items or start working on different colours. You can also start work on remembering colours outside of the here and now. For example, working on questions like “what colour is our table” when not looking at it – this needs an understanding of colour and the ability to remember and visualise items as well. Some children will progress through the steps very quickly, others will take longer. This is ok as all children progress differently. However if you find the child is really stuck it is worth going back a step and making sure they can complete it. If the child is stuck at the first step, it may be worth writing down the errors they make to see if they are consistently making errors, say with blue and green as this may indicate a perceptual problem with the colours like colour blindness, or it may just mean they aren’t quite ready to work on colour yet.